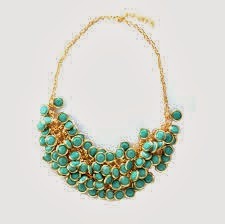 This Spring, get with the fashion lingo and make a statement with a statement necklace. Show your endless sense of style with an infinity scarf. Take your look to the max in a maxi skirt. And forget about caged animals, try a pair of caged sandals! Then follow up with bracelets. Lots of them. Layered up to your elbows, maybe even higher. Layer after clinking layer of chains, cuffs, bangles, beads, and Rainbow Loom. It's like a bracelet salad. And maybe try denim on denim. No, pastel with denim. No, white with black. And make it a shirtdress. Or a frill hem skirt with a crop top. Or a crop top with trousers. No, with soft pants. Okay, absolutely no crop tops - boyfriend tee instead. After ALL that - if you can still see through all those trendy layers - look for your coral lip stain at the bottom of your fringed cross body bag before walking out the door to go to... uh, to go to... give me a minute and I'll think of someplace to go besides staying home to take selfies. Fashion lingo... who makes this stuff up? Back in the day I was wearing jellies, Swatch watches, and stretch-stirrup pants. My mom was wearing Go-Go boots with mini skirts and granny gowns with hippy beads. And my Nana wore sloppy joe sweaters with pleated skirts and saddle shoes. And way back in time, Biblically-back in time, various groups of people were wearing ephods and simlahs and tunics and sashes. And some folks also "girded up their loins," which doesn't sound very cover-of-Vogue-ish, nor very sanitary. Moving on. Another Biblical reference to clothes comes from Colossians 3:12: "As God's chosen people, holy and dearly loved, clothe yourselves in compassion, kindness, humility, gentleness, and patience." Who needs a statement necklace when you're wearing "clothes" like that? "I care for you, I'm here to comfort you, I've got all the time in the world for you" - talk about statement-making! And they're one-size-fits-all, too. Everybody wins! So, demanding my way, being really mean, and eating too much cake - definitely clothes I want to take off. Compassion, kindness, and especially patience - most definitely clothes I want to put on.